This is Angie (Lou Ann's sister) and Jim with a quick update. Lou Ann and H.R. made it to Almaty Tuesday afternoon. The hotel is nice, it has very small rooms, but it does have air conditioning which they are very happy about. The hotel has many restaurants nearby as well. Alexis is doing great and besides having a little trouble napping with all the excitement she seems to be having a ball with her Mom and Grandma. Lou Ann has not been able to get to an internet site yet, but has heard of one four blocks away that she may use soon. 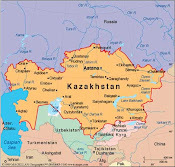 They are working on getting all the documentation from Kazakhstan and then they can start on the U.S. side of things. That is all for now and hopefully Lou Ann will be able to update the blog soon.